Injury caused by direct impact to the patella. Palpable deformity of the patella. Can be very swollen and ecchymotic. A fractured patella can make it difficult to walk, but not impossible. Once splinted straight, patient can walk a short distance relatively pain-free. at a 20 – 30 degree angle, the position of comfort. RICE to control swelling if appropriate, but not in a cold environment. Injury caused by a direct force to the patella tendon just inferior to the patella. When the patella tendon ruptures, the patella will retract up the leg. The patella with the ruptured tendon will be noticeably more proximal compared to the other knee. They can walk with the knee held straight. They can flex but not extend the knee. Splint with a posterior knee splint in the position of comfort, usually slightly bent. Ace wrap to control swelling. Usually minimal bleeding from the rupture. When the patella dislocates, it moves laterally. The affected knee will be flexed to about 30 – 45 degrees. The patella can be easily reduced. Place your hand on the lateral aspect of the knee, with your fingers in the popliteal fossa and thumb against the patella. As you straighten out the lower leg with your other hand, push your thumb against the patella forcing it back into the patella groove of the femur. As the leg straightens, the patella will pop back into place. The sooner this maneuver is performed, the better it works. Once reduced into proper anatomical position, the knee should be splinted and an Ace wrap applied. If possible RICE the knee. 1. History/MOI: How were the forces applied to the knee? Does the knee feel stable when standing and weight bearing? 2. Drawer test: With the knee at 90 degrees, push and pull. Instability can indicate a cruciate injury. 3. Lachman test: With the knee at 30 degrees push and pull. 4. Med/lat distraction: With knee slightly bent try to distract med/lat. Instability can indicate a med. or lat. collateral ligament injury. The most comfortable splint is a posterior knee splint that maintains the knee at a 20 – 30 degree angle. A dislocated knee is a very painful and destructive injury. In order for the knee to dislocate, support ligaments had to be torn. There is obvious deformity of the knee joint; typically, the tibia is pushed posterior to the femur. Pressure on the arteries behind the knee can compromise the circulation to the lower leg. All dislocated knees are surgical knees. Because the supporting ligaments have been torn, it is usually simple with minimal discomfort to realign and reduce the dislocation. Gently place knee in proper anatomical postion. Check and monitor circulation distal to the knee. Splint in position of comfort with a well-padded, posterior splint in position of comfort, usually bent at about 20 – 30 degrees. Ace wrap to control swelling. The shoulder was forced past the normal range of motion. The shoulder is locked in position and painful to motion. Depends upon the position of the humerus. If the humerus is abducted past 60 degrees then use the Mosher Technique. Mosher Technique is a gentle passive technique using position and gravity. 1. Have them place the hand of the affected arm on top of their head. 2. Have them place their other hand on top of their head also and interlock their fingers. 3. Lay them flat on their back, and then allow the elbows slowly relax, under the tug of gravity, towards the ground. The dislocated shoulder will spontaneously reduce back into proper anatomical position over then next 5 – 15 minutes. If the humerus is hanging down next to the body then use the Traction at the Elbow Technique. 1. Have them sit up in a chair or on a rock, whatever is comfortable. 2. Have someone else stand behind them and place their hands on the patient’s shoulders to support them sitting up straight. 3. With the affected arm beside the body and with the elbow flexed at 90 degrees, place a wide sling at elbow. 4. The sling needs to be in a loop to support your foot. 5. Place one foot in the loop and apply gently in-line traction to the upper arm. Do not move the arm, keep the forearm bent at 90 degrees and maintain gentle traction. 6. After about 5 minutes of gentle traction, without straightening the forearm, externally rotate the arm, if there is sufficient traction the shoulder will reduce and pop back into place. 7. If not then continue to maintain traction, if necessary slowly increase the traction-in-line. 8. After about 5 minutes again externally rotate the forearm to about 90 degrees or until the shoulder reduces. 9. Once the shoulder has reduced back into proper anatomical position, place in a sling and swathe and monitor circulation. 10. Transport, may walk if comfortable. May be angulated, if angulate straighten out with traction-in-line. Apply a sling and swathe to support the humerus and forearm. Fractures and dislocations very painful. Treatment is to support with sling & swathe. May have to straighten if circulation impaired distal to injury. Once under traction, and the elbow has slid into proper anatomical position, you may slowly extend the forearm until circulation restored (pulse at wrist). May need to straighten if circulation is impaired, but this is unusual. Splint with wrist at 30degrees of extension, and the fingers at the MCP joints relaxed at about 60 degrees of flexion. Pain in the anatomical snuffbox can indicate a fracture scaphoid. Splint with wrist at 30 degrees extension & fingers at 60 degrees of flexion. Reduce dislocated fingers with TIL, may require ant/post pressure. Splint fingers in position of function, flexed as if holding a soda can. The Pelvic bowl is a very vascular area. A fractured pelvis can be a source of severe internal bleeding. Can only shift a fractured pelvis once. MOI: The pelvis is injured by direct impact and/or compression. To properly evaluate the pelvis the patient needs to be awake & alert with no other distracting injuries. Typically in severe pain and unable to walk. They will have guarding, in that they will not be willing to move their legs or try to sit up. Place your hands on the sides of the pelvis, over the iliac wings, and gently lean on the pelvis pushing it towards the floor or ground and then with you hands in the same position compress the pelvis by pushing your hands towards each other, lateral compression, as if trying to close and open book. Any motion and/or pain indicates a fractured pelvis. You can only move a fractured pelvis once, due to the risk of internal bleeding. The pelvis is lined with a great many of blood vessels, it is very vascular and can therefore be the source of a major internal bleed and hypovolemic shock. During exam if the pelvis shifts, like closing a book, do not let go, hold the pelvis closed until a pelvic binder can be applied or improvised. A pelvic binder is a 6″ – 8″ wide piece of fabric that is wrapped around the pelvis and then secured to prevent the pelvis from falling open. This can be improvised from any 6″ – 8″ wide piece of cloth and secure it with cravats or belts to hold the pelvis still and prevent it from falling open. There are also commercially available pelvic binders. In the long-term care setting you should also wrap the abdomen with two 6″ wide ACE bandages to shrink the potential space for blood to collect in the abdomen if internal bleeding were to occur. MAST or Pneumatic Anti Shock Garments also work very well to stabilize a fractured pelvis and control internal bleeding. Keep flat on their back. IV fluid for shock if indicated. The clavicle tends to break in center to distal 1/3, the fracture is tender and palpable. Sling & swathe on the affected side. Concerns: Monitor for shortness of breath, possible pneumothorax. Is a very uncommon injury, requires a direct blow to the scapula. Concerns: Monitor for signs of respiratory distress. Point tenderness over the ribs, may have crepitation with deep breathing. Increasing pain with deep breathing. Monitor for increasing shortness of breath. If, on physical exam there are decreased breath sounds on one side = pneumothorax. Sling & swathe to support injured side, and monitor for tension pneumothorax. Two or more ribs are broken in two or more places that causes a free floating section. This is a true life-threatening injury, evacuate ASAP. Positive pressure ventilation, with 100% O2 if possible. Position of comfort to support respirations. Beware of taping bulky dressings that can depress the flail section making it more difficult to breath. Hole in the chest wall that extends into the pleural space allowing are to move in and out of the pleural space interfering with breathing. Airproof dressing that is taped down on 3 sides over the wound effectively creating a one-way valve. This allows the air to vent from the pleural space helping to prevent a tension pneumothorax. Monitor for signs of respiratory distress and a tension pneumothorax. A pneumothorax is air escaping into the pleural space causing the lung to collapse. A tension pneumothorax occurs when the pressure on the side of the collapsed lungs builds up to the point where it compresses the heart and compromises circulation. If tension occurs with tracheal deviation, JVD, and 1 -2 word dyspnea they may need a needle thoracostomy or place a chest tube to decompress the tension and restoring circulation and improving air exchange. Pre-hospital personnel are trained to treat all possible spinal cord injuries based on the Mechanism Of Injury (MOI) as well as symptoms and complaints. It is important in the wild environment for rescuers to recognize a possible back injury based on MOI, but, it is equally important that they be able to rule out a spine injury or “clear the spine” by a proper history and physical exam in order to avoid an unnecessary litter evacuations. The upper back, thoracic vertebra, by direct force. Are the conscious, coherent, sober, or in any way obtunded. Monitor every 15 minutes until stable, every 1 hour x 24 hours. If unconscious or obtunded, treat as if injured until AWAKE & ALERT. Is there a “distracting” pain. Are they complaining of pain anywhere in the vertebral column. Is there radiating pain, numbness, paresthesias into the hands/arms. Are they guarding or is there paravertebral muscle spasm. Is there pain on palpation over the vertebra or in the vertebral muscles. Can they feel and move all four extremeties. With movement, is there any locking sensation or impairment. Awake, alert, oriented x 3, completely sober, have no distracting pain. Be pain free and no palpable tenderness on physical exam. No palpable step-offs or malalignments. Have full C/S/M in all 4 extremeties (not caused by another injury). Active range of motion without pain or locking. Move patient into proper anatomical position = supine. Maintain alignment = move as a unit when lifting or rolling. The most dangerous cervical motion is flexion. The most dangerous thoracic & lumbar motion is rotation out of alignment. Provide cervical immobilization with bulky, conforming, comfortable materials. Keep supine on ensolite pad in bivouac. If unconscious, monitor airway, if unable to monitor place in recovery position. Transport on well-padded but rigid/stiff back supporting materials. Long-term cervical collars can become very uncomfortable. clothing such has a pile jacket. They provide support, comfort, and warmth. Backboards or litters are only necessary for the carry-out. They will become very painful over time so they require extra padding especially behind the knees and in the small of the back. Backboards are not required in litters. While waiting for help to arrive simply keep the patient still and comfortable. Remember not to flex the neck and keep the spine straight by log rolling the patient. Sprains & Strains:Sprains and strains are by far the most common backcountry injuries. Sprains and strains are injuries to muscles, tendons, ligaments, and the supporting structures of joints. 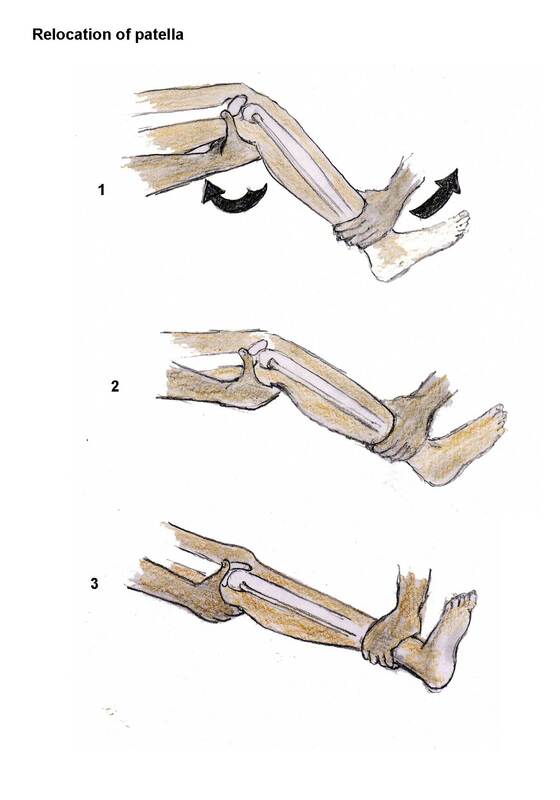 Think of how a sprained ankle appears. There is generalized pain and tenderness around the affected joint. Unlike a fracture that is no point tenderness, if there is then suspect a fracture. There is pain with movement of the affected joint. There is pain with weight-bearing or use of the affected joint. Swelling can be rapid and dramatic because of bleeding from the damaged blood vessels. The area may become discolored over several hours, “black and blue” = ecchymosis. Consider the mechanism of injury. Expose the injured area to look at the injury and the skin. That includes removing boots and socks. You cannot properly evaluate an injury that is hidden by clothing. Gently palpate the area for pain, tenderness, and crepitation. Put the injured joint through passive range of motion, that is, you gently move the joint and monitor for pain, loss of motion, or crepitation. Loss of motion, a locked joint, indicates a dislocation. Rest, put the affected joint at rest. This will minimize blood flow and chance of further injury. Ice, keep the area cool, this causes vasoconstriction thus reducing bleeding into the damaged tissues. Compression, with a wide ACE wrap applies counter pressure to damaged tissues, again helping to control bleeding. Elevation, raise the affected area above the level of the heart to decrease blood pressure and aid in the control of bleeding. Immobilize & support affected joint. Splinting the affected area puts the injury at rest allowing the healing process to begin and continue. Once again, Paul Auerbach has managed to provide us with a tome that holds an absolute wealth of information. He has not only updated all the information contained in the previous edition, but he has also called upon more experts in the field who have added a wide variety of new topics. 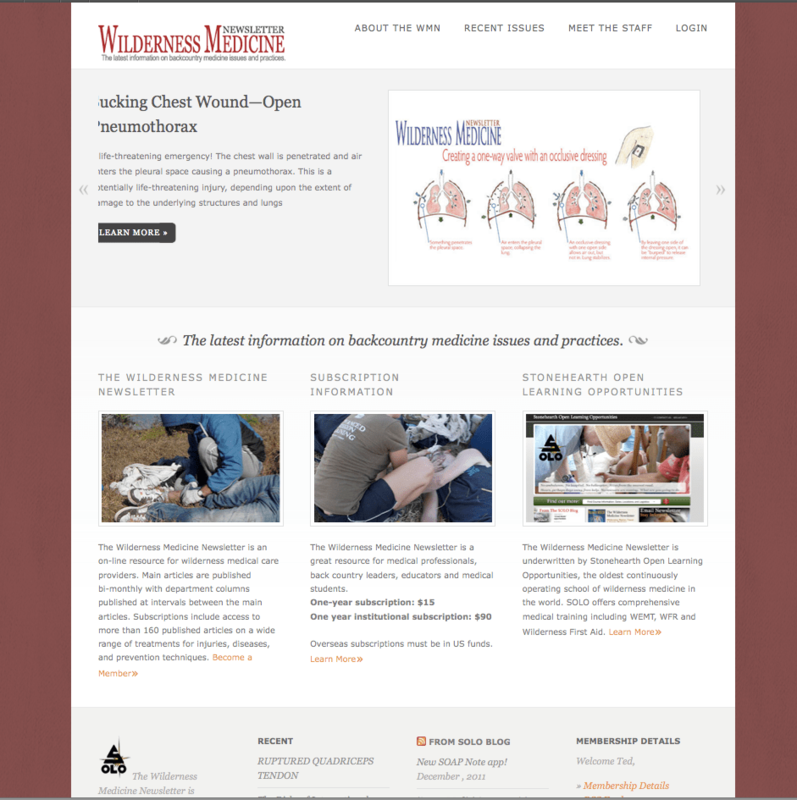 The list of contributing authors reads like a Who’s Who in Wilderness Medicine and Rescue. This text is a true accomplishment and a marvelous contribution to the wild side of medicine. The Fifth Edition, 2007, consisting of 2316 pages is divided into 97 chapters, written by 157 contributing authors. A myriad of charts, tables, and spectacular photography complement the well-written text. Needless to say, I have not had the time to read the entire book, but the several chapters I have read were packed with valuable information for all of us who are interested in or participate in wilderness medicine and rescue work. Paul, a personal thanks. Great job! What a tremendous contribution this text will make to emergency medicine that is practiced in the extended care environment. Wilderness Medicine, Fifth Edition, by Paul S. Auerbach, MD, MS is published by Mosby, ISBN 978-0-323-03228-5 and available through www.elsevier.com and probably amazon.com.